Finally, we get a 'dislike' button. I'm not sure that "sad" is correct. It looks more like "Oh no! What has Spadaro said now?" 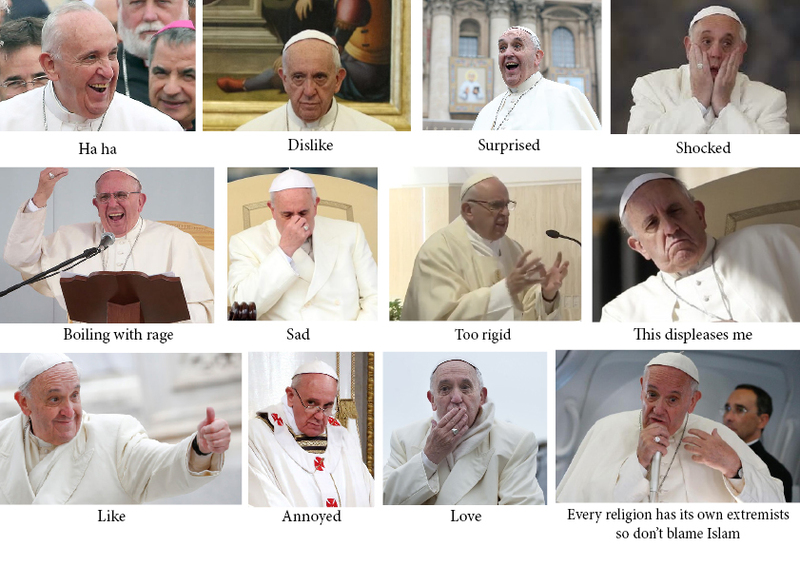 Laurence.I can't stand the sight of The Bergoglio any time. I may get a lot of use out of "This displeases me." Stop complaining about the rock on which the church is built. Unfortunately, this particular 'rock' is somewhere between talc and gypsum on the Mohs Scale (and in this case, Mohs stands for Magisterium of Him-Self). If our church stands on that rock it's at the edge of a sandy cliff. Psalm 118:165 Much peace have they that love thy law; and to them there is no stumbling block. Our Pope and Our Cross is forever complaining about putative Pharisees - those faithful Catholics who strive to honor and actualise all the Commandments of Christ - and claiming those Pharisees are not open to the surprises of The Holy Ghost, which, let's be honest, is a reference to his agenda of rapidly introducing novelties that will forever change the Church and the opposition to those novelties by the Traditionalists whom Franciscus calls Pharisees. Franciscus rarely seems to be at peace during his many public appearances during which time he berates those who do not surrender to his agenda of rapid and radical change. In fact, can it be said that Franciscus loves God if he does not love His law? I do think Psalm 118 specifically identifies the problem Franciscus has; he does not love the Ten Commandments, the Commandments of Christ, or the unwritten laws and praxis of multimillenial existence, Tradition - and, thus, how can it be said he loves God? The greatest and truest praise that can be conferred on anyone is to say they love God's law; for if they love the law, they love him who gave the law; and if they love him, they love everything belonging to him; and thus, on their part they have no enemy; but, as far as they are concerned, they are at peace with all. Again "To them that love God all things work together unto good," and, therefore, he that loves God should be at peace with all; and, therefore, the Apostle, Gal 5 says, "The fruit of the spirit is charity, joy, peace, etc. By the same process of reasoning, "there is no stumbling block"; to him "who loves they law;" he runs on smoothly to his country, for he who loves the law cannot give scandal, scandal being a sin, and sin being a breach of the law; but scandal offended by others, either applies to the infirm, who, from their ignorance, look upon as forbidden what is not forbidden at all, and take offense at things they thought were illicit; or it is that of the Pharisees, who put a bad construction on what should have been viewed in quiet a different light. But they "who love the law" are neither infirm not Pharisees, and, therefore, "to them there is no stumbling block." One has a duty to pray that Franciscus is quickened and revivified by love.